John 12:28-30(MSG); I’ll say, ‘Father, put your glory on display. '” A voice came out of the sky: “I have glorified it, and I’ll glorify it again.”The listening crowd said, “Thunder!” Others said, “An angel spoke to him!” Jesus said, “The voice didn’t come for me but for you. The Christ told the people around Him that the voice came for them and not for Him. It means that God’s communication was for their benefit and not Christ’s benefit. But did they hear what God said? No! There are those who heard thunder. There are those who assumed it was an angel speaking, only Christ heard the very words of the father. The men who heard thunder were indifferent to the lines of communication in the realm of the spirit; when communication from the spirit came to them, they could only attribute it to a work of nature and weather. The men who assumed it was the voice of an angel are those who have an understanding of communication in the realm of the spirit but lack the wisdom to distinguish voices in that realm. Men who hear the voice, like Christ did are those that are deeply acquainted with communication in the realm of the spirit and because they are, they receive the instruction with which the voice comes. The voice of God is distinctive. He wants you to hear it like Christ did. He does not want you to be barbaric to His voice because to be barbaric to the voice of God is to be barbaric to divine purpose and instruction. 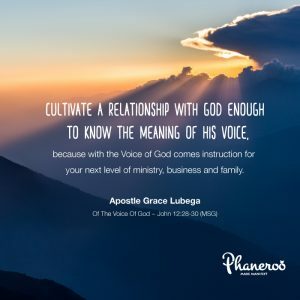 Cultivate a relationship with God enough to know the meaning of His Voice, because with the voice of God comes instruction for your next level of ministry, business and family. FURTHER STUDY: 1 Corinthians 14:7-11, Revelation 3:20(AMP). PRAYER: My Lord I thank you for the clarity of your voice in my life. I thank you for the divine instructions imparted in my Spirit with the understanding of your voice. I can never stray off my course of destiny. I live a life patterned after divine instruction and as such I manifest the life of God everywhere I go. In Jesus’ Name. Amen.